The oldest town in France, Massalia was founded in VI century BC and its position of opening on the Mediterranean Sea made it a place of exchanges and mixtures of cultures. Today, some 111 districts extend around the Old Port; From L’Estaque which offers a breathtaking view of the harbor, to the small southern ports that open on the Calanques. Marseille has a few traditional products such as santons, these little terracotta figurines depicting scenes from southern life, and of course, Marseille Soap (warining: the real Marseille soap must contain 72% olive oil ). There are many culinary specialties, but Pastis, bouillabaisse, aioli, shuttles … and pizza (the inventor of the pizza truck is from Marseille!). 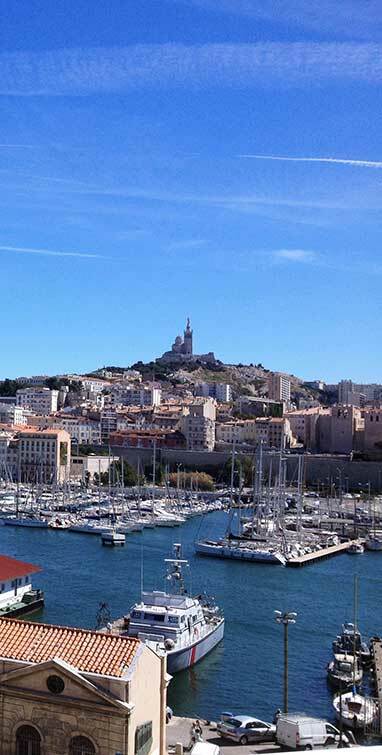 Walk the neighborhoods of the Panier, the Canebière and the Vieux Port: cradle of the historic Marseille, to feel the atmosphere so special of the City. Discover the Mucem and its mediterranean garden: to open up to the cultures of the South and the Mediterranean. Guided tour and digital track game for children. This little fishing port is situated between “the Calanques” and Cap Canaille (The biggest coastal cliffs in Europe). It is possible to admire its beautiful contrasted colors from the “route des crètes” which permit to join La Ciotat. Its white wine, dry and fruity has to be tasted! To have a pastis or glass of white wine from Cassis on the port. To drive on the famous « route des Crètes » which join Cassis and La Ciotat, through Cap Canaille. Then, to visit the « Parc du Mugel », in La Ciotat, at the foot of the « Bec de l’Aigle » (beak of eagle). Astonishing panoramas ! The Museum of the Santons Di Landro which presents the know-how of these santon manufacturers. Visit the workshop and unique pieces. Admirable town, very pleasant to furrow on foot. From fountains to mansions, the shady town center is full of small shops. Specialty: the calisson. Getting lost in the Old Aix, its narrow streets, its shops and its art galleries. A must dos! Benefiting from the Mediterranean climate, the thermal spa of Marseilles offers cures in rheumatology and respiratory tracts around a source of calcium sulfurous water.